Those of you who’ve heard some of my ‘tree-hugging’ talks might think I’m being sarcastic…but plastics have transformed our lives for the better, in everything from transport to technology. I want to persuade you that we should value plastic, and keep it circulating instead of chucking it away. The story of plastics begins in the early 1800’s with the development of rubber and cellulose, with the first synthetic plastics developed from petrochemicals during WW1 – first for car interiors, then electrical insulation, followed by polythene, polyester, perspex and a plethora of other polymers. Our childhood memories often involve plastic: for me it was Lego, Airfix and dolls with movable joints. Plastic has transformed sports – everything from baseball to badminton, and running to roller-skating. If you like outdoor adventures, plastic keeps you warm, safe and dry. For construction, it means lightweight, cheap, durable, strong materials: for pipework, cables, fixings, paints and insulation. Plastic in cars and trucks reduces cost and weight whilst improving performance, comfort and safety: moulded dashboards, ergonomic seats, airbags to keep you safe and even self-repairing bumpers. However, it’s not all good news. We’re starting to find out that plastic brings problems. In the UK, we recycle only about one-third of our plastic, with most of that exported to developing economies. Around 60 per cent of UK plastic waste is packaging, with 40 per cent from consumers and the remainder from industry. China, which dealt with around half the world’s waste plastic, stopped importing plastic waste in 2018, creating major headaches for government and business worldwide – Britain exported 800,000 tonnes of plastic waste to China in 2017. Some of the additives and colorants in plastic are toxic, with potential to harm humans and living systems even whilst in use: causing cancer and disrupting hormones. There is little research into what happens when plastics begin to degrade and release those chemicals. 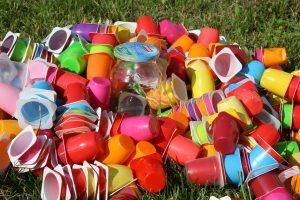 Plastic may be labelled as biodegradable, or compostable – but be careful! This doesn’t mean it creates food for nature – only that it breaks down and doesn’t disrupt the composting process of the other natural materials. Regulations limit the levels of heavy metals in the compost – but they are still permitted. Micro-fibres escape from polyester clothing when we wash it, ending up in sewage sludge, then used as fertiliser. Scientists are discovering micro-particles everywhere: in Scotland’s remote waters, in mountainous regions in Europe, and in a recent study, plastic particles were found in over 90 per cent of samples of bottled water from 11 leading worldwide brands. The average was 325 particles per litre of water. Wet wipes are changing the shape of riverbeds across Britain. Clean-up campaign group Thames 21 found over 5000 wet wipes in a survey area of 100 square metres in April this year, around 15 per cent up on the previous year’s total. We don’t value plastic. Plastic, and especially plastic bottles, could be the poster-child for our ‘waste economy’ – take, make, use and throw it away. In the UK, we each generate over 1kg of plastic waste, each week. We recycle only about one-third of our plastic, with most of that exported to developing economies. The UK government has pledged that by 2042, it will eliminate all ‘avoidable’ plastic waste – but starting with cotton buds and plastic straws seems to be picking the easiest targets with a likelihood of minimal impact. UK Packaging Waste (PRN) fees recover only about 10 per cent of the cost of collection and recycling – so citizens pick up the rest of the bill and suffer the health and environmental consequences. Every time we throw plastic away, we have to replace it, finding new oil in ever-more difficult and expensive locations. Recycling saves energy and carbon emissions and costs less. How does the circular economy help solve the problem? But it could take years to replace all the single-use plastic with better materials. We should value plastic as a fantastic resource, and ensure we keep it circulating in our economy. That means designing it to last longer, and so we can easily identify and separate it for more effective recycling. In the long term, this saves money! Use perpetually recyclable polymers. In April, Science magazine reported that Prof. Eugene Chen at Colorado State University had discovered plastic-like material (a new polymer) that can be recycled infinitely, whereas normal plastic degrades as it gets recycled. The new material avoids the need to use petro-chemicals too. Plastic-eating enzymes – scientists recently discovered a way to transform plastic back into its original components, meaning it can then be made into new, high quality plastic. Switch to alternative, plentiful, resources like mushrooms and seaweed to make bioplastics. 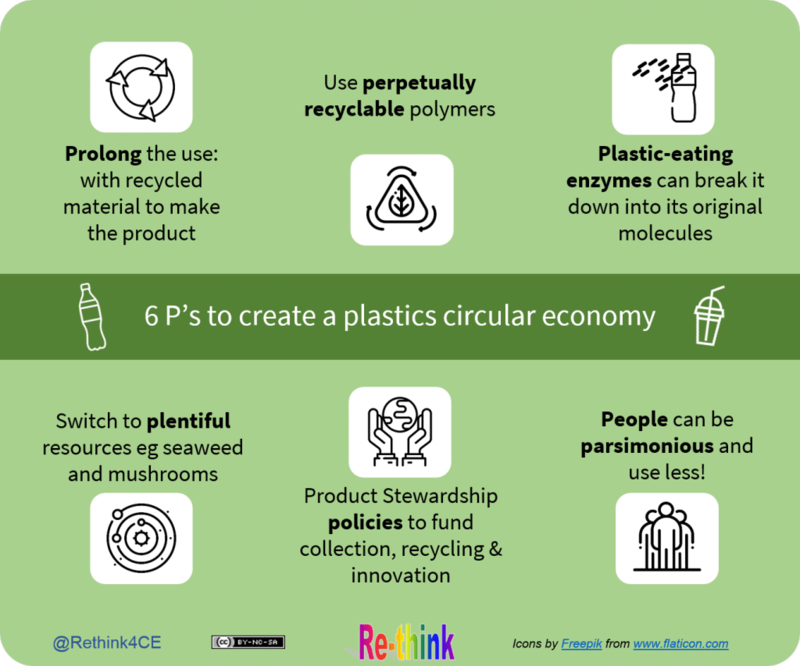 Product Stewardship policies: there are six main types of plastic in common use, so I believe that every piece of plastic put into the market should be properly recyclable, and councils should work together to collect and recycle every type. We can use the EU Packaging Waste Regulations to recover the full costs of collection and processing from producers and retailers, and help fund research and innovation. Policies should penalise those companies using additives, coatings or colourants that reduce the quality of the recycled material, or make it much more difficult to recycle. We can be parsimonious and use less! Instead of being part of the problem, we can all be part of the solution- take our plastic bags and wrappers back to the supermarket, separate our bottles and yoghurt pots for the council to collect, and complain about any non-recyclable items – or even better, find an alternative, such as bin bags from potato starch). Don’t pollute, poison or push into landfill/be part of the problem/perpetuate the problem – recover it, recycle it or replace it with something renewable.